Mitakihara U, happy Friday to you all! 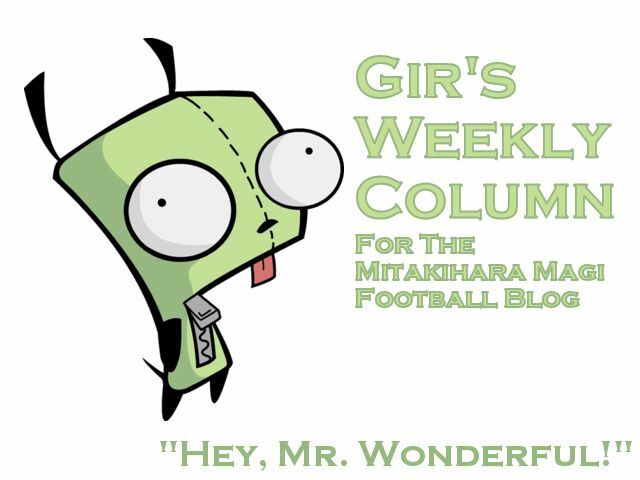 I am Gir Todafunk, cornerback for Tatsuya Kaname's Mitakihara Magi, here with another Weekly Column for your newspaper of choice and your football blog of choice. Well, for a second straight week...we played in a rainstorm. It was much lighter than last week, but it was still rain. Anyway, we crushed BYU, 238-14 and now we are 2-0 on the season. Woo hoo! My stats sucked, though. I only had one interception and one tackle all game. I picked off a pass 20 yards for a touchdown, had a tackle for a loss and that was it. At least Nyaruko didn't get a tackle. All he had was a pick. Matter of fact, we couldn't even pad our stats, none of us on the cornerbacks crew could. And you know why? The defensive line was too boss on Saturday. LaRon Wright, Ryan Hodge, Travis Clark...they were laying a licking on Penn State's QBs. And Ray Williams was just a dominator when he came off the bench. Five sacks on the night. Rush the pass, rush the pass, rush the pass. That's all we did. We took them out of their game, but what about Kevin Walker. We call him "Highway" because his mind is as free-spirited as driving on a highway without the cops on the trail. Highway was on the run: he returned a kickoff 81 yards for a score. That got us fired up. Then he returned a punt 43 yards for a touchdown. And this was in the first quarter. As for The Pig...I think by the end of Week 3 he could be at 2,500 yards passing. Haru threw for 738 yards, only because Penn State's punter sucked and Haru wanted to scramble a little bit more. I'm sure if all those scramble yards were passing yards, he would have had a 900-yard day. Guy is amazing. As soon as we hit 210, he went to the bench and got a rest so that D.W. could come on board and take over. I really hope Haruyuki gets that record of 19,000-something yards and passes for 20,000. But he needs to run up the stats this week so that he has plenty of games to get it done. He's only sitting at under 17,000 and needs to run it up. I'm sure Case Keenum is paying close attention to this because if Haru stays healthy and passes for 400 yards over the next 10 games, he's got the record. As for me, I'm in another hotel room. Our team at the Hampton Inn State College, located in the center of the city. I am currently doing a taste test of different potato chip brands and flavors, and for me, I prefer Herr's to Utz. I know, people prefer Utz because of the name and the fact that it represents Pennsylvania better. But I just like the flavor and texture of their chips. Of course, nothing beats Kettle Foods. Must be a Northwest thing, really. I have familiarized myself with the mystique of the Jerry Sandusky incident, and for me, it really saddens me to see that Joe Paterno's legacy has been forever tainted by this whole thing. This happened decades ago and has changed Penn State forever. All the victims have passed on and for me, I pray for their families and hope they are able to learn from the tragedies that took pace well before I was born. Aside from that, Penn State is just Penn State: one of the most well-rounded sports programs in the country. Nothing but huge props for them. So I personally look forward to facing them with the rest of my mates tomorrow at Beaver Stadium. Hopefully it doesn't rain. Gonna get some shut eye, then I will talk with you all next week on the next Weekly Column. This is Mr. Wonderful himself, the one the only Gir, signing off. You are not alone.